It is tough to disagree with the charm of hardwood floors. They provide a luxurious and eternal beauty to any home or office. However, hardwood flooring can be expensive and difficult to install. If you are looking for that classic look for a fraction of the price, you may consider an alternative in engineered hardwood. Engineered hardwood, unlike conventional hardwood (which comes out of a tree and into your home), is a multi-part product that consists of multiple layers. The outermost layer is a hardwood veneer, which is comprised of a thin slice of wood (usually 1/8’’) in the species of your choice. The layers below this can be comprised of high density fiberboard, plywood, or hardwood. These core layers are what make engineered hardwood more stable, while the outer surface delivers its legitimacy and beauty. You will see that engineered hardwood is virtually indistinguishable to a normal hardwood floor, and it differs from a laminate, because of the surface is made from real wood. When looking at the notable pros of engineered hardwood, one may see the selling points become clearer. Engineered hardwood is designed to mitigate the problems moisture would typically cause a solid hardwood floor. The extra layers of engineered hardwood not only block moisture, but also provide increased stability. It will not warp or deviate from its engineered shape, providing a flooring surface that requires little maintenance. 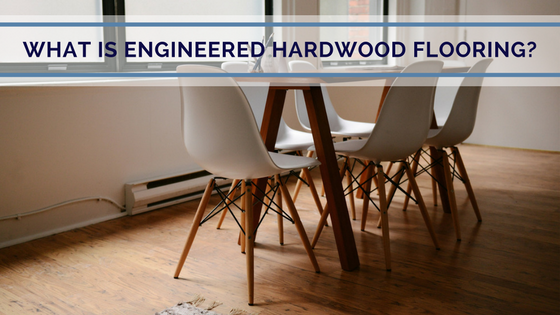 Perhaps the most intriguing selling point for engineered hardwood, is its price. High-quality engineered hardwood floors typically cost between $4 and $18 per square foot, although certain rare species of hardwood can cost more. On average, hardwood flooring will cost in the range of $6 to $20 per square foot. You see this decrease in price because you only use a small slice of natural wood, compared to a normal hardwood floor. Due to the fact that only a small amount of actual wood is used, the environmental impact is significantly decreased. For those considering an environmentally friendly approach to your home flooring, engineered hardwood could be the flooring option for you! Engineered hardwood will give your home the warm look you desire, while providing an array of extra benefits. Your engineered hardwood will come pre-finished, so the stain and protective finish will show more consistency immediately. Since there is this decreased amount of time associated with installation, you will be on your way to enjoying your beautiful new floor in no time at all.